We just completed a big move from a small office space into a much larger, 'OMG is this for real' studio. For me, moving ranks right up there with the greatest of nuisances - dental visits, airport security lines, and flu shots. I recognize I'm complaining from a place of great privilege an opporunity ... but moving just stinks. 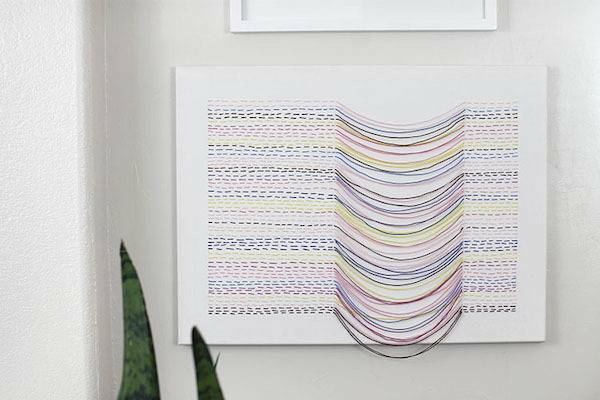 Alexis's DIY embroidered canvas art is about the sweetest art DIY art project I've seen in ages. Not only is it a snap to make, it's fool-proof. To replicate her creation, all we need is some stretched canvas, embroidery floss or craft thread, a needle, scissors, ruler and a pencil and eraser. To see how Alexis put it all together, please visit Persia Lou. My husband and I regularly fight over the cable management system (or lack thereof) in our home. It's bad. Cords are everywhere. We just haven't made our way to storing everything in "the cloud", and even still, some things will always need a cord. Here are 10 solutions for the inevitable cord clutter! I've been on the fence with the shiplap trend. Part of me feels it has a tendency to look like the walls you hang racks on in retail stores, but part of me also feels that, if done right, it can take on a beautiful and beachy-calm (new style phrase) look. And that's just how this room turned out! For less than $150! Read on to see the final look! This post is brought to you by Bill Murray and the movie 'Groundhog Day' because here we go again. One year ago, I was writing a post about the big move into our own studio space. It was a huge step for us, for in moving we made the decision to find a space that allowed us to create more work-life balance (less emailing/preparing dinner/managing homework, more intentional family time at home). Now, here we go again! Through a series of unforeseen - but maybe also fortuitous - events, the organization in charge of our space has decided to do major work on the building and cease rentals. As my new office space started coming together, I realized I had a very large blank wall that needed some major artwork. On the opposing wall, I have a small trio of frames, so I didn't want to do the same on the big wall. But I didn't want just one big image either. So I did what we all do, I searched the internets for some inspiration. One product popped up from Umbra (pictured above) that caught my attention immediately. The 30" x 26 1/2" configuration would be perfect photographs that hold a special place in my heart but have yet found a special place enlarged on my walls. This shelf might be the smartest little addition to a workspace or bedroom that I've seen in a while! Its versatility is truly inspirational and I can think of one million and one ways that I could use one in my own home! Just look at all the different uses!